Around the circumference of this extraordinary shield sits eight Devi incarnations and Durga, the warrior goddess. This group is known as the Matrikas: mother goddesses who are all different forms of Parvati, the goddess of power. According to a later episode of the Devi Mahatmya that deals with the killing of the demon Raktabija, Durga created the Matrikas from herself and, with their help, slaughtered the demon army. When the demon Shumbha challenged Durga to single combat, she absorbed the Matrikas into herself. Shachi, also known as Indrani (the queen to Indra, the King of Gods), is seated on an elephant and is said to be the goddess of beauty. Varahi has the head of a boar and sits on a buffalo. She is the shakti of Varaha, the boar avatar of Vishnu. She sometimes wields the chakram and fights with a sword and tusks. Brahmani, sits on a hamsa (a swan or goose) that holds her rosary in its beak. She is considered to be the Shakti of the creator-god Brahma, and an aspect of Adi Shakti, who is the personification of primordial cosmic energy, and the source of Brahma’s powers. The next goddess, astride a buffalo, is suspected to be an Ishta-devi, or a tutelary devi, favoured by the patron of the shield. Vaishnavi comes next, seated on Garuda, and holding a trishula, snake, sword and shield. She is thought to be the shakti of Vishnu—one of the principle deities of Hinduism. Maheshvari is also seated on a buffalo, but in contrast to the Ishta-devi, she brandishes a trishula in her left hand—an aspect she is known to take from Lord Shiva. Chamunda sits upon the body of a man and is the only Matrika who is a Shakti of the great goddess Devi rather than a male god. She is also the only one of the group that enjoys worship in her own right and is traditionally offered ritual animal sacrifices and wine. She is very often identified with Kali and can be similar to her in appearance and habits. Finally, Kaumari, the shakti of Kartikeya, the god of war, rides a peacock and, as expected, is well armed with a mace, sword, ankus and a small vessel. At the shield’s centre is Surya, the sun god, who many Rajput elders claim descent from. His image is found on shields from Mewar and used as the insignia of their royal court. 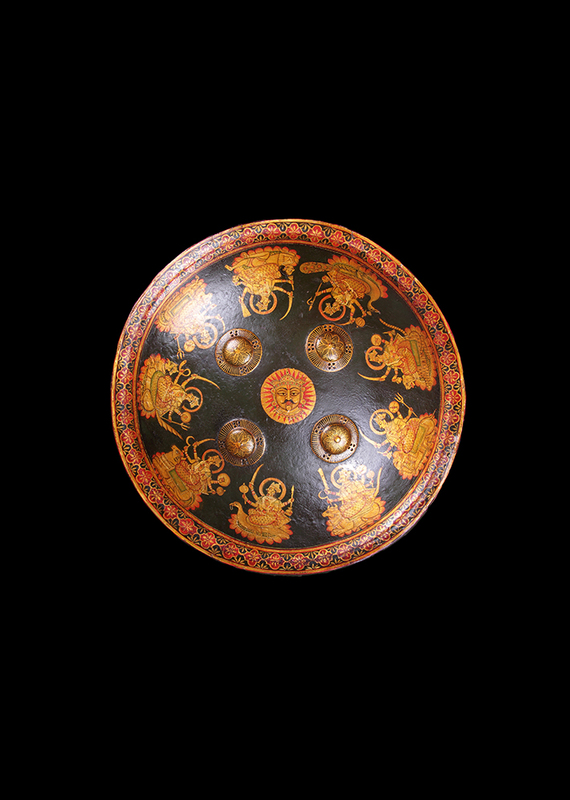 Unusually, the four bosses around him have been painted black to match the rest of the shield, with golden details picked out by a steady hand. The rear remains undecorated but has four iron rings for the attachment of a pad and handles. These two factors suggest the shield is an older one that has been redecorated later in its life—a common practice in Rajasthan. For instance, a katar in a private collection known to the author bears an inscription that records a battle victory in 1831 AD, and its subsequent removal from the Silekhana Armoury and redecoration in 1872 AD. Despite there being few published examples to go by, changes in how Surya is depicted at the centre of Mewari shields do seem to occur. These could be due to the styles held by different painters, or specific schools, but it is an interesting comparison nonetheless. On two early 18th century shields in the Delhi National Museum he is shown with a thin face, eyes wide with small pupils, and his moustache stiff. However, on two shields in the Jodhpur Armoury, dated to circa 1820, he is shown with a fuller face, softer eyes and a round chin. Our example, from around 1850, depicts his face softened further, his eyes sleepy and his round chin more accentuated. The face on the following item in this catalogue (no.28) has a slightly rounder face than the two shields in Delhi but retains its intense gaze to confirm the 18th century dating. My thanks to Naveen Kumar, CEO of the Jagdish and Kamla Mittal Museum of Indian Art, Hyderabad, for his help in identifying the goddesses. G.N.Pant and K.K.Sharma, Indian Armours in the National Museum Collection, New Delhi National Museum, 2001, pp.85-88, nos. 76 & 77. R. Elgood, Rajput Arms & Armour, Volume II, Niyogi Books, 2017, pp.886-887.